MISO is currently over capacity, but having introduced a voluntary capacity market approach (with predictably very low pricing) are attempting revising it to make it easier for "load-modifying resources to participate" (MISO having a high percentage of renewables), and take into account the location of generators. -ISO-NE and NYISO both have capacity markets characterized by locational capacity requirements. "Planning for resource adequacy—something that was relatively simple in the context of vertically integrated utilities—continues to be a difficult issue in competitive electricity markets. Whereas state public utility commissions used to have exclusive authority to determine what generation needed to be built and when it was to be available, this responsibility has been assumed by RTO/ISOs in regions with competitive markets. Each region approaches resource planning differently, and each region faces unique problems." I may not have a PhD in divinity, like some people who know all about generating electricity, but I saw the latest Surplus Generation Report, and I recognized 10% of 15000. The Premier would know our grid can't feed Vatican City. 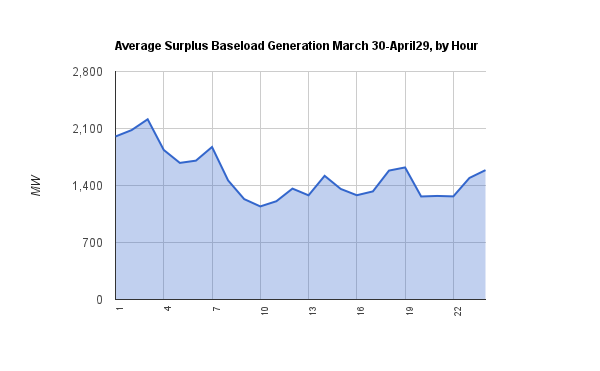 Point Lepreau is behind schedule and over budget, but the timing worked out well as the deep recession during the outage made replacement power cheap. If the next 25-30 see reactor performance as efficient as the first 25 were, it will work out well for New Brunswick. The Canadian Nuclear Safety Commission (CNSC) announced today its decision to authorize NB Power Nuclear (NBPN) to proceed with reloading fuel in the newly refurbished Point Lepreau reactor. NBPN will also require CNSC's approval prior to restarting the reactor, which will remain in a guaranteed shutdown state until that point." If you get through it, go to 1974 and read the Economist's "The Coming Glut of Energy" -- and if you still have it in you, here's a link from 14 months after that, which is on the arriving glut. "Across the country, the oil and gas industry is vastly increasing production, reversing two decades of decline. Using new technology and spurred by rising oil prices since the mid-2000s, the industry is extracting millions of barrels more a week, from the deepest waters of the Gulf of Mexico to the prairies of North Dakota. At the same time, Americans are pumping significantly less gasoline. While that is partly a result of the recession and higher gasoline prices, people are also driving fewer miles and replacing older cars with more fuel-efficient vehicles at a greater clip, federal data show."